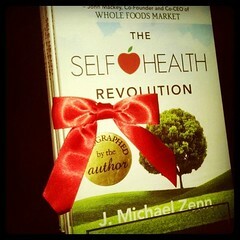 Here is my interview with the author of one of my favorite books, The Self Health Revolution. J. Michael Zenn. energy lost in their youth. This book is under 200 pages, filled with pictures, tips and tricks and to me, more than a book. This is a potential life changing vehicle. I have given this book to friends, family and clients. I keep a copy in my kitchen. In this audio clip, Michael generously shares some of his wisdom with us. Enjoy. Like this post? Leave a comment or Share it!